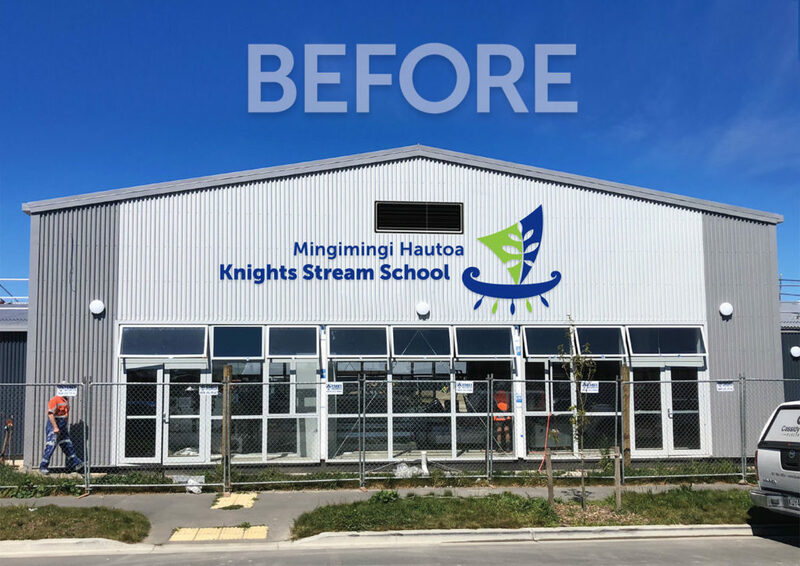 Knights Stream School's doors opened to families at the beginning of 2019 but the work on their visual branding began over twelve months earlier. What resulted was an exciting new brand image that truly reflects the dreams and aspirations of their Foundation Principal and Board of Trustees. It was well thought out and managed. 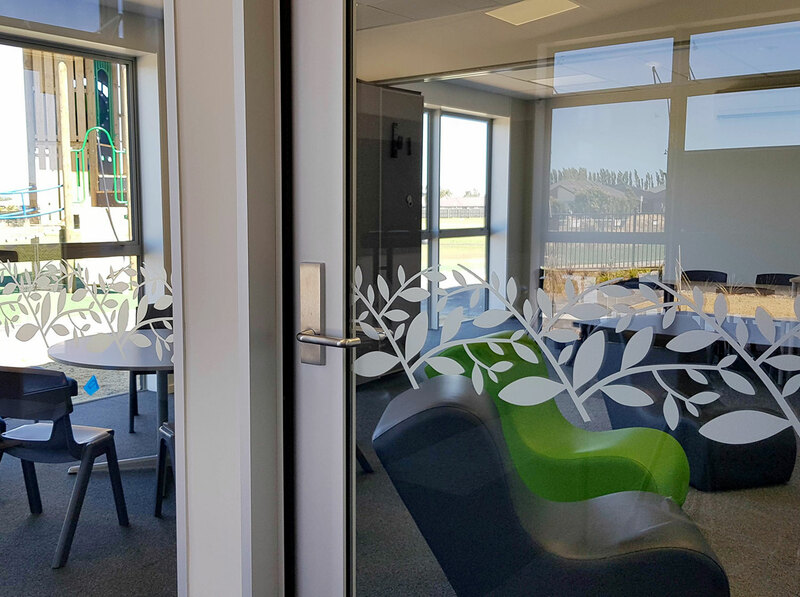 Branding for a new school build takes careful planning in order to put the pieces of the puzzle together correctly so that, when the school finally opens, everything works well as one cohesive look. This planning began in November 2017 when I was approached by one of the school's Foundation Board Members to design a new logo and brand identity. After much discussion the Board decided they wanted a waka for their school logo. The waka was an historically significant symbol and could be used by the school as a metaphor to help unbundle their unique attributes and values. 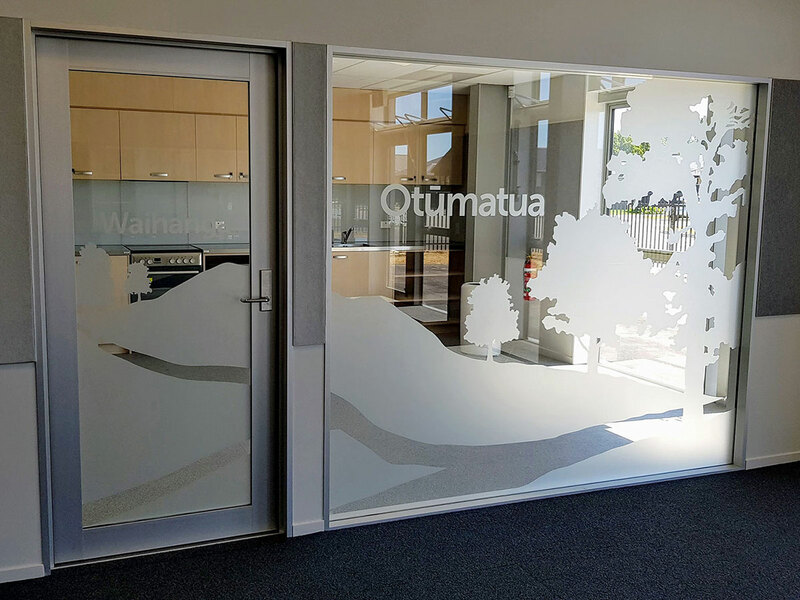 It was easily recognisable and could be used, as a starting point, to talk about their school beliefs to staff, whānau and especially students. Why is the waka significant as a symbol? Local Māori used the river system to explore, trade and catch food. In particular the Knights Stream (Ōpouira) area was known for waka being hauled from river to river. It's not a traditional looking waka though. A river waka has no sail and an ocean dwelling waka, that sails long distances, does. The logo is a hybrid as opposed to a true representation of either. 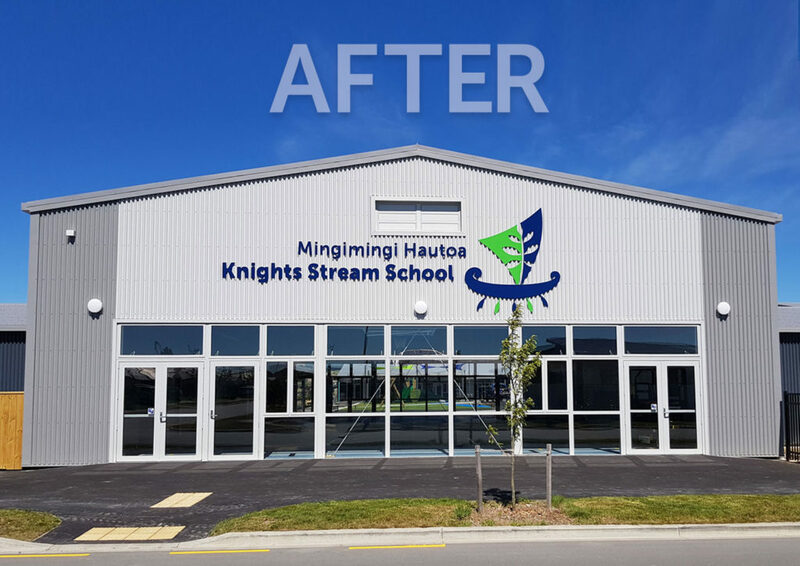 This is to acknowledge that Knights Stream students will depart the school one day and traval long distances, to other parts of the world, where they will continue their learning journey. 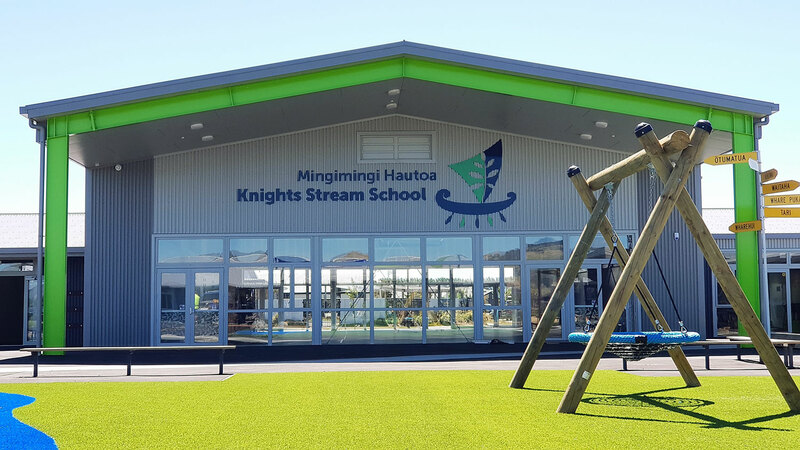 The school was gifted their Māori name by Te Taumutu Rūnanga, “Mingimingi Hautoa” - The Courageous Mingimingi. Mingimingi are very tough little shrubs, they can withstand horrendous winds, rugged coastal conditions, extreme cold alpine environments along with very wet and dry conditions. In fact Mingimingi is one of the toughest New Zealand shrubs and will survive almost anything. As such it has been chosen as a metaphor for the Knights Stream School students. They want their students to be courageous, resilient and able to survive challenges that life brings. 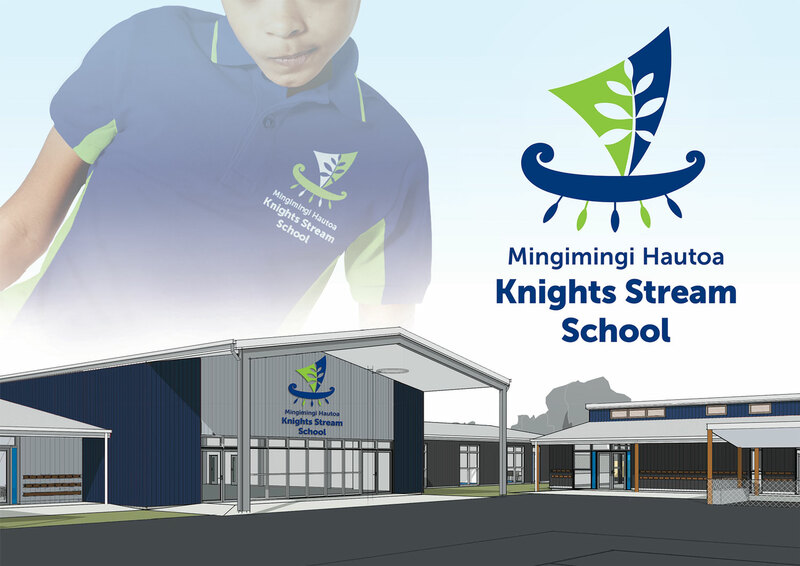 The sail symbolises the Knights Stream School's vision powering them forward while the wind (unseen) represents the NZ Curriculum. Wind is captured by the sail and transformed into the School Curriculum which, in turn, shapes the Classroom Curriculum where students live the vision as courageous learners (as represented by the Mingimingi branch on the sail). The school community is symbolised by the waka boat - comprising of teachers, parents, whānau (large koru at the back of the boat) and students (small koru at the front of the boat). Students guide their own learning with their parents/whānau and teachers supporting from behind when required. The school desires that their students be independent motivated learners. 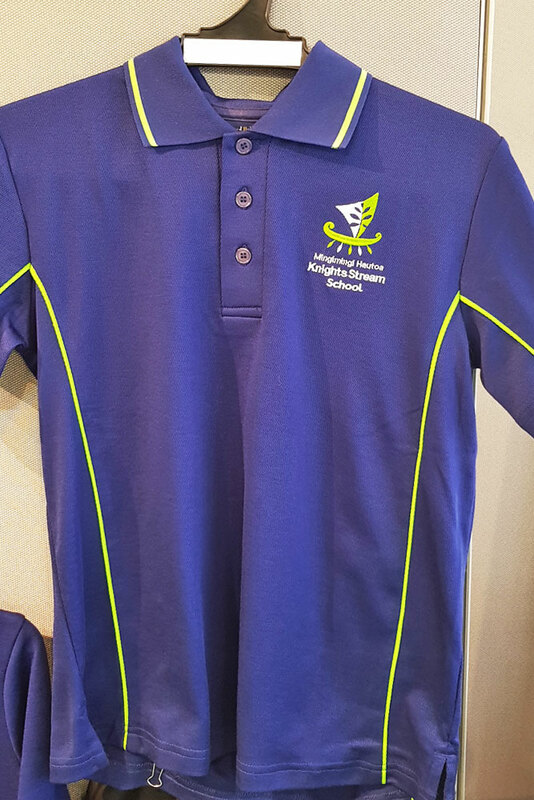 Knights Stream's core values (Care, Courage, Creativity, Curiosity and Connection) are symbolised by the oars. They are tools used by the school community to help propel the school vision in the right direction. We achieve our best when we all paddle together! We saw at the planning stage that there was no need for large stand-alone signs given the layout of the school. Instead we used the buildings as spaces to display the school logo large enough so as to be seen well from a distance. The logo colours (especially the green) were used on the buildings, in selective places, to help tie the buildings in with the overall brand look. Mock-ups of signage were created on artist impressions, provided by the architect, as well as on images of the buildings prior to completion. The Principal and Board could see exactly how the logo would look in the different locations before making the decision to have them constructed. As can be seen below there is virtually no difference between the mock-up and the finished appearance of the logo on the side of the building. Boards and Principals can feel confident in the knowledge that what they are seeing in the planning stages is very close to the reality. Every building block was gifted a geographically significant Māori name. 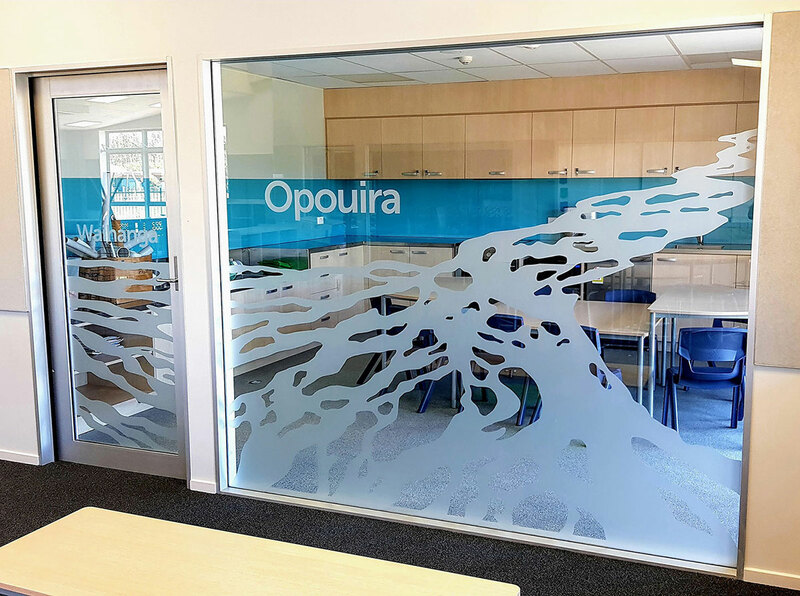 I created designs for each of the names and these were used on the windows and doors of the breakout spaces inside their respective blocks. 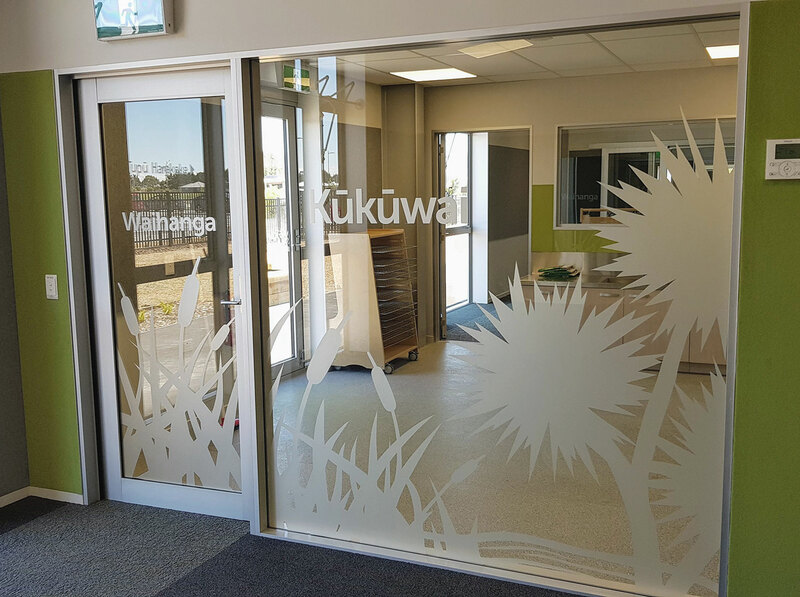 A mingimingi pattern was created for all the other windows and doors. 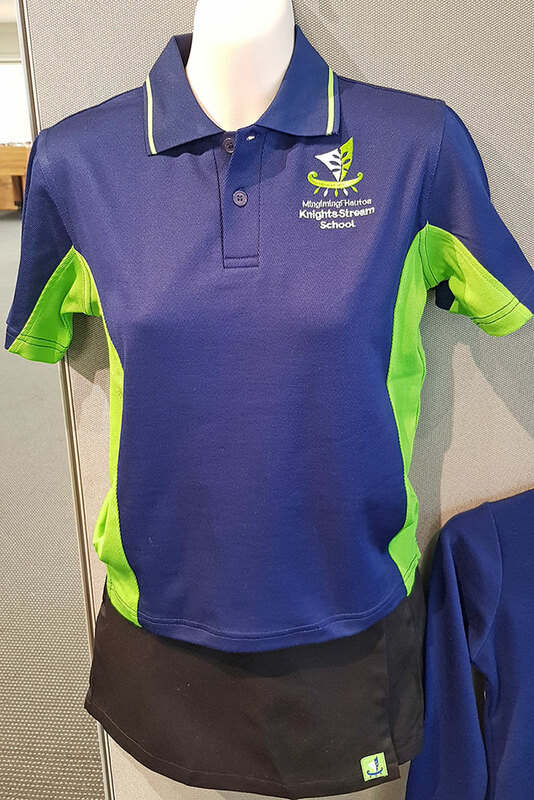 This is the most predominant pattern acting as an important brand identity element throughout the school. It was a thrill to see everything come together so well. 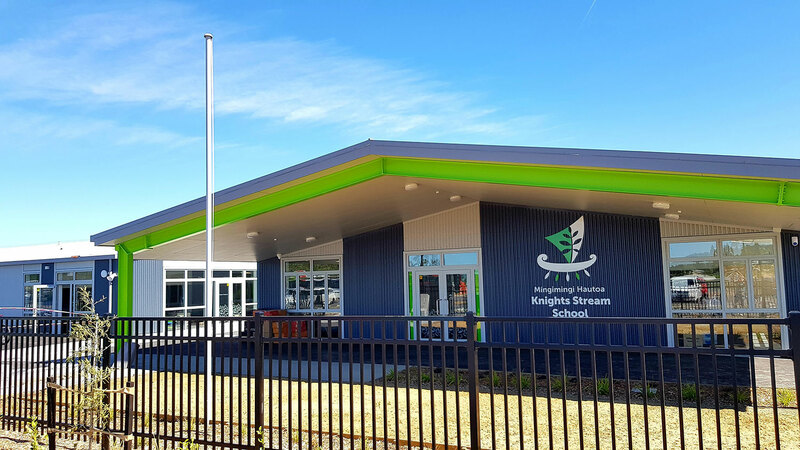 The key to Knights Stream School's success was their early planning around one year out from opening. 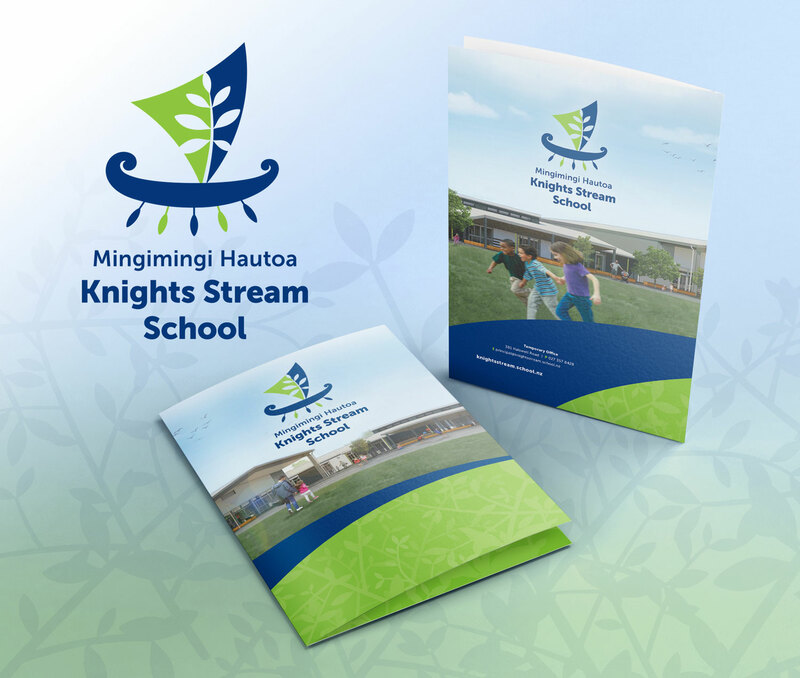 It allowed them time to think about how their brand image could be integrated into the school buildings. Not only that, their early planning also provided the Ministry of Education Project Delivery Manager the ability to allow for this in the budget - a vital piece of the puzzle! 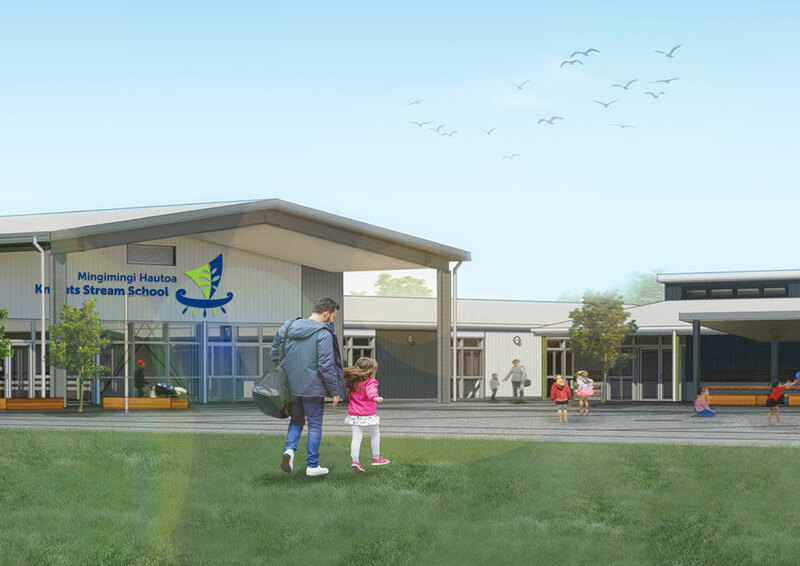 In the planning stages of a new school build? I have worked with a number of Foundation School Principals and Boards in sorting out their new logo, look and story. Let me know if I can be of help.